You could say I had something like a slight epiphany earlier today as I was sitting in a Bible study discussion group. We have been studying parts of the New Testament throughout this last school year, and are now covering one of my favorite books of the Bible: James. I think many of us within the Christian adoption community hold several Bible verses dear in regard to orphan care> James 1:27 being “one of the best!” But my passion for orphan care and activism for widows was slightly squelched today. My heart literally skipped a beat. Okay….James 1:27 (NIV) says “Religion that God our Father accepts as pure and faultless is this: to look after orphans and widows in their distress and to keep oneself from being polluted by the world.” Overall I’d say this verse is pretty easy to understand in my mind…I take it or I paraphrase this as “the acts of my belief system that Jesus Christ looks upon as good is to care for the orphans and widows in their time of need”…. That’s how I take the first part of this verse. At the very core of what I am to believe, I should be caring specifically for orphans and widows. The study question that was asked during this week’s lesson was “Think of people outside your own family and friends in terms of Jms 1:27. List specific groups of people that might be considered “widows and orphans” today.” Ummmm….this question was truly easy for me to answer as I think the verse is quite specific in the “groups” of people I would choose…..ORPHANS AND WIDOWS! When I first answered this question during my week study I thought to myself “duh! The answer is obvious!” But it wasn’t until group today that my hearts’ passion was stopped in its tracks for a second. My small group members did an awesome job at answering this question in terms of the people they are around daily…which is EXACTLY the way the question encouraged us to take this passage. Totally acceptable, totally honest, BUT totally made me aware of something we do often as a Western culture and Church…we most often categorize the idea of widows and orphans to mean the “needy” and thus, look within our lives to the individuals we are closer with to help. But what do we do specifically for widows and orphans???? The answer sadly in a lot of cases is- nothing. I believe we have been given a direct command to care for widows and orphans. I don’t believe the use of those two words is a metaphor. Sometimes it’s easier to help someone who falls under the category of “needy” (which let’s face it, we’re ALL lacking something in some way or another) because it’s “easier” and more “convenient” in reference to this verse. Granted there are other places in the Bible where the ambiguous group of “needy” is listed, but why do we tend to overlook these two groups of hurting people: the orphan and the widow. We definitely have both groups in our society and culture. So I ask: why as the Western Church and within our denominations are we not out working to care for the orphan and widow on a larger scale? I know that I am sensitive to the idea of orphan, and many will think I am writing this because I am just trying to be an activist for orphans strictly because we are in the adoption process….BUT, I think it is so much more. I surmise this is one area where as a culture within the Church we have dropped the ball. We lack great activism for social injustices toward orphans and widows which results in a lack of direct care for both groups. Hmmm….I’m thinking there’s a ministry opportunity we could be developing here…??? Just an idea….! Are you still with me??? Am I totally off my rocker??? Are we totally missing the boat? I don’t know about you, but I’m dying to walk on the water and step out in faith to do something…wanna be challenged with me???? 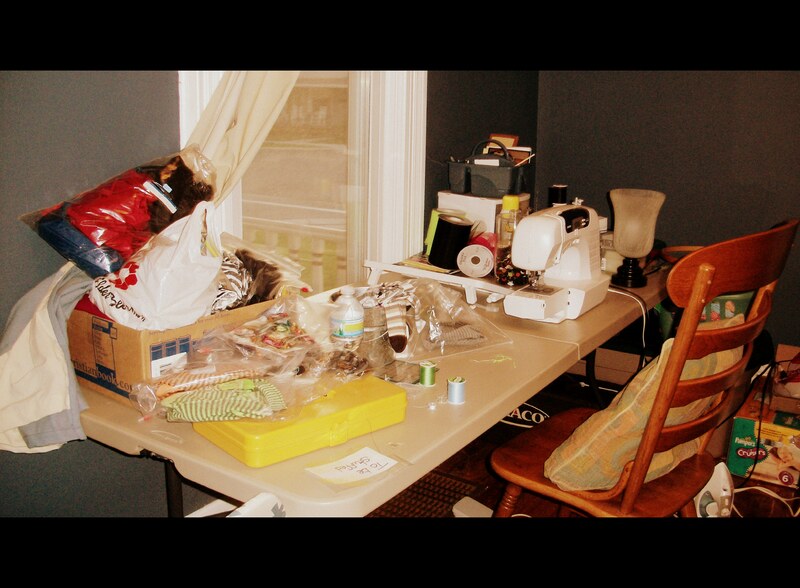 SO, if you happen to stop by our house and peer inside the front room’s window you’ll notice MANY piles of things atop the spare bed, the table with the sewing machine stacked with many, many fabric scraps, and Rubbermaid boxes EVERYWHERE! 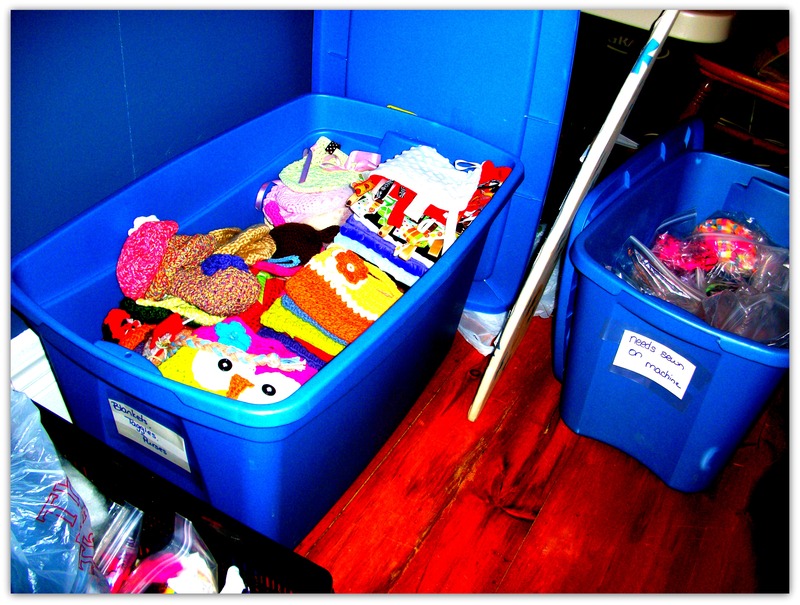 There are seriously 7 full size Rubbermaid boxes filled with various stages of the sock monkey building-process. It’s a sight to behold. 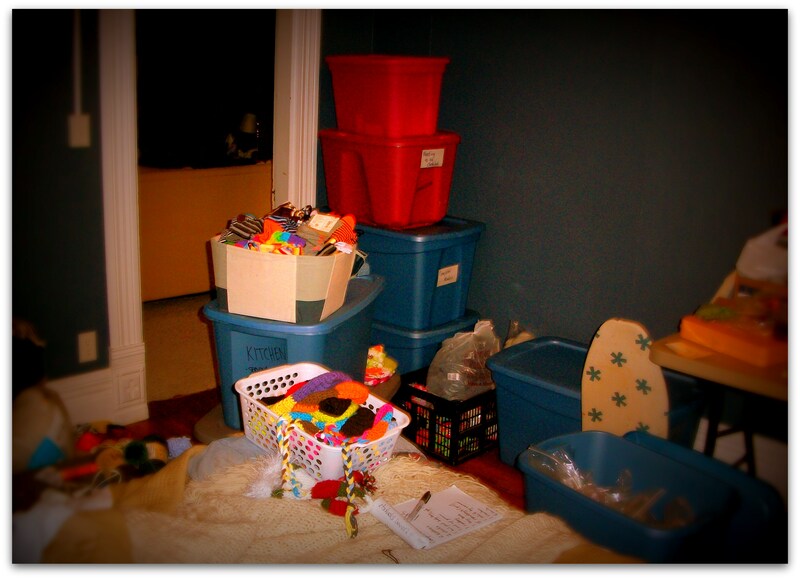 BUT, it’s thankfully a pretty organized process, or I’d potentially lose my mind! HA! So, to add to this transparency of craziness, here are a few pics! 🙂 Please don’t judge. 🙂 It’s an “organized” mess. 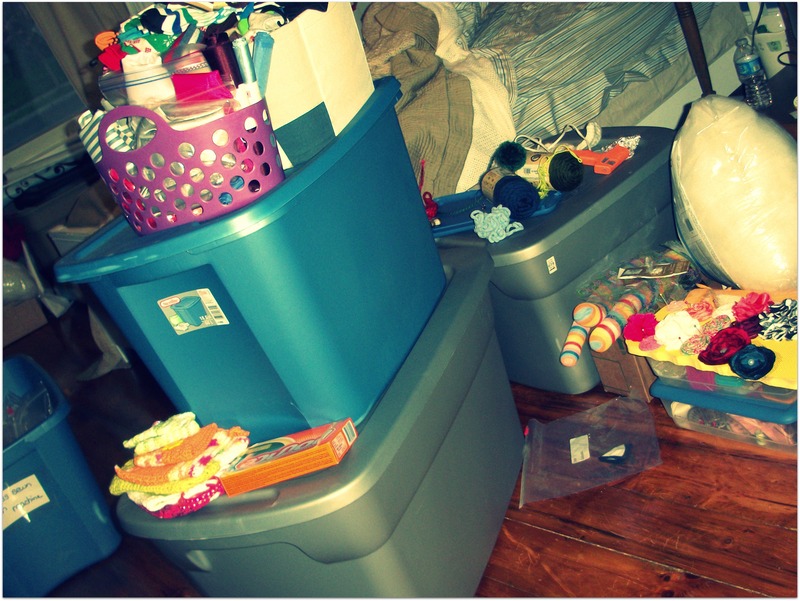 Have I overwhelmed you with my organization messes yet? 🙂 Anyone who feels sorry for us would like to help would totally be welcomed! In all seriousness though, we have really been blessed and supported well throughout the craft shows/fundraiser! It has been so fun meeting new people, coming up with “new” designs, and utilizing skills we had no idea we had! We have truly been blessed, and we send out a HUGE thank you to those who have helped along the way! Now…I’m off to continue twirling my crochet hooks! 🙂 HA!